The KING is He Who dispenses by His Self, His Epithets and His Attributes with any existing being; and is needed by everyone. Any king of the created beings can not dispense with everything because he is stricken with poverty to Allah, he is in earnest need of his subjects’ support, protection from his foes and enemies, and remedy from diseases and plights. Of course, only some of his people will need his power. There are kingdoms of human beings, Jinn, and animals, and any kingdom is inevitably ephemeral; the king will either die or have his kingdom invaded or demolished by someone else. 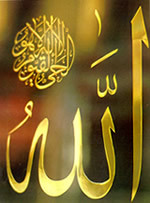 Allah is the absolute KING; He is needed by every singleone of His creatures and He dispenses with everything. His Kingdom iseverlasting and eternal, He is the Lord of Power and Authority as He isthe Creator of all kingdoms. He possesses this world and the hereafter;on Doomsday all claims tumble and Allah calls, “Whose will bethe dominion that day?” as no one answers, He says, “That ofGod, the One, the Irresistible!” (GHAFIR, 16). He grasps heavens and earth and shakes themvigorously saying, “I’m the KING, where are the kings of earth? whereare the tyrants? where are the haughty?” (Hadith). Praise be to the Lord and Possessor of Existence, Glory be to the KING of all kings, the Possessor of every possessor or possessed; praise be to the KING, He is Allah.